I sometimes cover for my friend Thom Kendall who is the UMASS sports photographer. 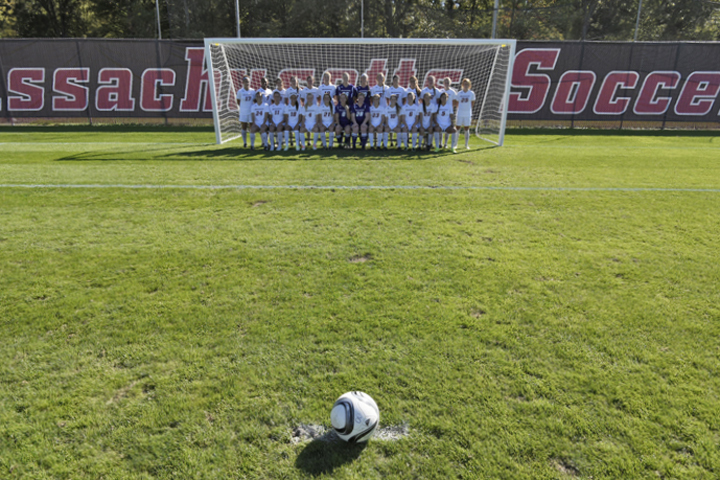 He had two simultaneous events this afternoon, so he asked me to shoot the women’s soccer team photographs. I know the wide angle kind of distorts the distance, but the ball is on the spot for a penalty kick. After I took the photograph, I attempted the PK. A total miss, but they were great sports. But hey, with 26 goalies, who could score? I feel so fortunate that my life as a photographer allows me to connect with such diverse organizations and people. There was so much life in these young women, and it was such a beautiful day. It made me really happy to lark about with them before they got down to the hard work of practice and being students.